SINGAPORE - Fresh graduates and professionals can start signing up for infocomm technology (ICT) training programmes via a new portal launched by the Infocomm Development Authority of Singapore (IDA) and the Singapore Workforce Development Agency (WDA). They can choose from a directory of 380 training courses and certifications, which are part of the Technology Skills Accelerator (TeSA) first announced by Finance Minister Heng Swee Keat in this year's Budget. It is one of the initiatives to mitigate the manpower shortage in the ICT sector to help in Singapore's push to become a Smart Nation, which aims to use technology to improve Singaporeans' lives. Programmes under the framework will cover two main areas: (a) training in core ICT skills such as cybersecurity and software development which can be applied across all businesses, known as TeSA Core and (b) training in specific domain skills such as finance and healthcare for existing ICT professionals, known as TeSA Sector. These details were given by Minister for Communications and Information Yaacob Ibrahim in a speech on Friday (May 6) at the Nanyang Polytechnic School of Information Technology graduation ceremony. "We know that the demand for ICT skills is getting more specialised. For example, banks are not just looking for ICT professionals with strong foundations in data analytics, but also professionals who understand the financial industry, and who can apply their skills to complex financial transactions and analyses," he said. Adding that job placement will be a priority of TeSA, Dr Yaacob said: "Our objective is not just to train more ICT professionals, but to help them get better jobs and advance in their careers." 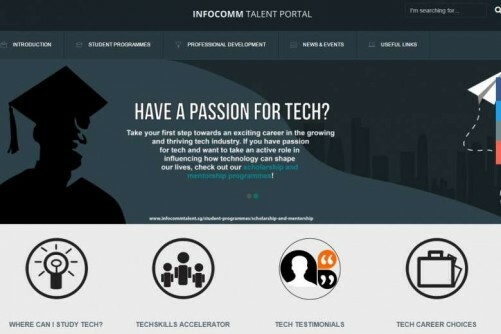 The courses on offer at the new portal (www.infocommtalent.sg) are based on the National Infocomm Competency Framework and include some covered by a funding scheme for Singaporean trainees called the Critical Infocomm Technology Resource Programme Plus. Thirty-four organisations, including the National University of Singapore Institute of System Science, Singapore Management University and NTUC Learning Hub are providing training. "The integrated portal empowers both fresh graduates and career switchers to deepen their skills and build job mastery, allowing them to acquire the necessary knowledge and experience to progress within the industry," said WDA chief executive Ng Cher Pong. "This initiative also supports the SkillsFuture movement to ensure that our Singapore workforce continues to build skills that will enable them to stay relevant in an innovation-driven economy." Singtel has also committed to train 130 professionals for cybersecurity job roles under a new Cyber Security Associates and Technologists programme, under TeSA Core, said IDA in a statement, adding that other employers such as ST Electronics, MediaCorp, DBS and UOB are also supporting TeSA. The agency has set up a programme office to operationalise the new framework. It will oversee the formation of a governing council and sector committees of employers. More details will be given in the next few weeks, IDA said. IDA co-managing director Gabriel Lim also said the partnership between the two agencies and industry on TeSA "will enable us to seize the many exciting opportunities in ICT as we make progress towards our Smart Nation vision".